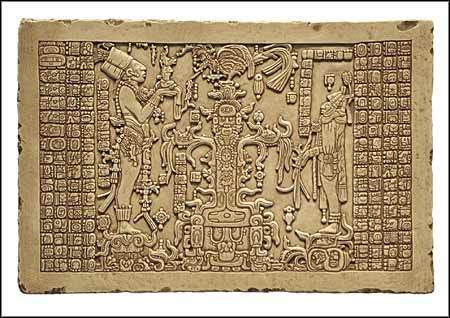 Tablet of the foliated tree of life, Tablet of the foliated cross, Maya Art, Maya, mayan art, tree of life, precolumbian reproductions, mesoamerican reproductions. Temple of the Foliated Cross, Palenque, Mexico. 698 A.D. The original of this tablet is located in the temple of the foliated cross, one of the three temples in Palenque, known as the Group of the Cross, built by King Chan-Bahlum to commemorate and celebrate his accession rites to the throne after the death of his father, king Pacal. The tablet shows Chan Bahlum on the left side, dressed simply with a loin cloth and his long hair wrapped in readiness to don the heavy headdress of kingship. His father Pacal stands on the other side, dressed in burial apparel. Pacal holds the insignia of royal power, the passing of authority will occur at the end of ten days of accession rites. In the center we see a variant of the tree of life formed by a maize plant rising from a band of water and the Kan-cross Waterlily Monster, which symbolizes the waters of the earth as the source of life. In the crown of the tree sits a huge water bird wearing the mask of the Celestial Bird. The branches of the tree are ears of maize manifested as human heads since in Maya tradition, human flesh was made from maize dough. Pacal is shown giving to his son a personified bloodletter, an instrument for bloodletting rituals and vision quests. It drew the blood of the King and brought on the trance that opened the portal to Shivalva (the Maya underworld) and brought forth the Gods.